Bonikowsky, Laura Neilson. "Arrival of Black Loyalists in Nova Scotia (1783)". The Canadian Encyclopedia, 25 January 2019, Historica Canada. 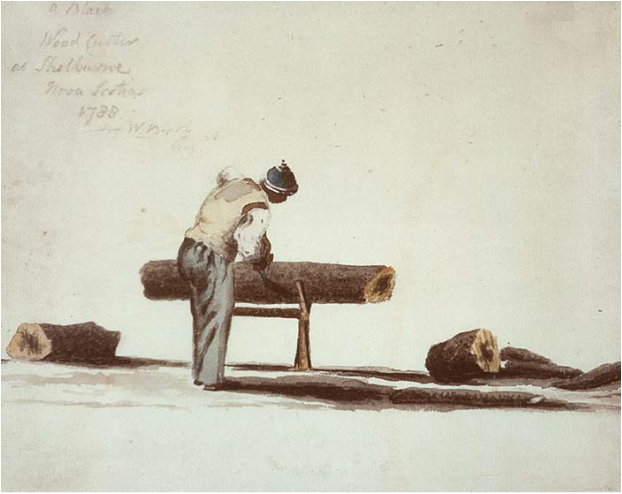 https://www.thecanadianencyclopedia.ca/en/article/black-loyalists-feature. Accessed 21 April 2019. Between 80,000 and 100,000 Loyalists eventually fled the United States. About half came to British North America. The main waves arrived in 1783 and 1784, when the territory that now includes the Maritime provinces became home to more than 30,000 Loyalists. Most of coastal Nova Scotia received Loyalist settlers, as did Cape Breton and Prince Edward Island (then called St. John’s Island). During the American Revolutionary War, more than 19,000 Loyalists served Britain in specially created provincial militia corps, accompanied by several thousand Indigenous allies, mainly Six Nations (Haudenosaunee) from New York State. 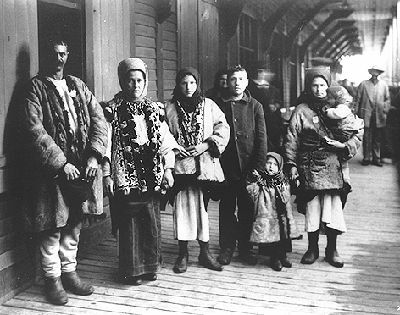 Others spent the war in such strongholds as New York City and Boston, or in refugee camps such as those at Sorel and Machiche, Quebec. The two principal settlements were in the Saint John River valley in what is now New Brunswick, and temporarily in Shelburne, Nova Scotia. The Loyalists swamped the existing population in the Maritimes, and in 1784 the colonies of New Brunswick and Cape Breton were created to deal with the influx. Loyalists were as socially and culturally diverse as the nation they fled, and comprised of soldiers and civilians, rich and poor, Black, White and Indigenous people. They shared little besides their plight as refugees. The better life the Loyalists sought did not come without cost. The massive influx of population created a demand for shelter and provisions that could not be met easily in what many called “Nova Scarcity.” Those left most in need were the Black Loyalists. Approximately 3,500 African-Americans arrived in Nova Scotia, to settlements near Shelburne, Digby, Chedabucto (Guysborough) and Halifax. Nearly half went to Shelburne, drawn by the dream of a place where they could live independently, on land they owned, and free from prejudice. The British promise was 100 acres for each head of household and an additional 50 acres for each family member, plus provisions. 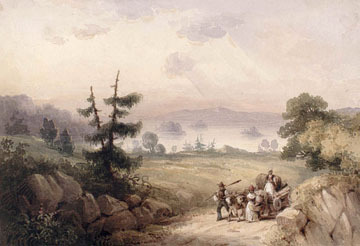 "Bedford Basin" by Robert Petley, watercolor, 1835, depicts a family of Black Loyalists in NS (courtesy National Archives of Canada/C-115424). Some Black Loyalists, such as Richard Pierpoint, a formerly enslaved man from Bondu (Senegal) and military veteran of the revolution, had gained their freedom by fighting under the British Crown during the war. Most, however, were enslaved and therefore brought to the British territories as spoils of war or as the property of Loyalists. By the 1790s, the number of enslaved Black people in New Brunswick, Nova Scotia and Prince Edward Island ranged from 1,200 to 2,000. To encourage White American settlers to immigrate north, the government passed the Imperial Statute of 1790, which allowed United Empire Loyalists to bring in “negros [sic], household furniture, utensils of husbandry, or cloathing [sic]” duty-free. By law, such chattel could not be sold for one year after entering the colonies (see Black Enslavement in Canada). Free African-Americans thought they would have equal claim to free land but soon discovered that the land grant system had become corrupt. Some, after waiting six years, received a mere quarter acre. Most were given less desirable plots across the harbour from Shelburne. There they founded Birchtown, named for Samuel Birch, the British commander in New York who had signed their embarkation certificates (see also The Book of Negroes). They became the objects of hostility and violence. Many sold themselves to merchants for a term of service, essentially returning to the enslavement they had fled. The Black Loyalists maintained their strength through religious faith, and several religious leaders became prominent in their new communities. This included David George, the son of enslaved African parents in Virginia. George had converted to the Baptist faith and was a founding member, between 1773 and 1775, of North America’s first African-American church, in South Carolina. He went to Shelburne in 1783, and his emotional sermons drew both Black and White settlers. By 1784, George had established a chapel in Shelburne. George’s following grew. He became the province’s most famous pastor, preaching in Black settlements, giving people strength and encouragement. He raised the ire of many who disliked both his message and the colour of his skin. They grew violent when George challenged the established racial hierarchy by baptizing White loyalists. Growing racial tensions between Shelburne and Birchtown reached a breaking point, and on 26 July 1784 a group of White Loyalists demolished George’s home. The mob went on to tear down the homes of about 20 other free Blacks living on George’s property. The rioting lasted for some 10 days (see Shelburne Race Riots). Thomas Peters, an enslaved man who fought for his freedom alongside the British during the American Revolution, travelled to London in 1790 with petitions outlining the Blacks’ grievances in Nova Scotia, including denial of the vote, trial by jury and equitable land grants. In London, Peters met the Sierra Leone Company, whose colony for freed slaves in West Africa was seeking Black settlers. He returned to North America with a government-financed scheme offering free land and independence in Sierra Leone. Although many stayed and built a permanent African Nova Scotian community, George and more than one-third of Shelburne’s Black population accepted the offer put forth by British philanthropists to relocate disillusioned Black Loyalists to Africa. Unhappy with the fact that Black people were denied the vote, trial by jury and equitable land grants, almost 1,200 Black Loyalists emigrated to Sierra Leone in 1792 and established the colony of Freetown. Today, the descendants of those Black Loyalists in Sierra Leone are identified by their Nova Scotian heritage. The Black Loyalists: The Search for a Promised Land in Nova Scotia and Sierra Leone, 1783-1870Read excerpts from this book that focus on the circumstances leading up to the exodus of Black Loyalists to Sierra Leone and the subsequent problems the new settlers encountered in Freetown. From Google Books. The Black Loyalists in CanadaCheck out this online copy of The Loyalist Gazette for an article on the challenges that faced communities of Black Loyalists in Nova Scotia. From ourroots.ca. Exploring the Lives of Black LoyalistsSee biographies of Black Loyalists and related archival material from the Atlantic Canada Virtual Archives. The Black Loyalist Myth in Atlantic CanadaA thought-provoking paper about the status of “Black Loyalists” in the years following the American Revolution. From the website Black Loyalists in New Brunswick. THE BOOK OF NEGROESWatch episodes from the six-part CBC TV miniseries based on author Lawrence Hill's award-winning novel.